Maybe it’s because I took two years of French in high school. Maybe it’s because during my undergraduate curriculum I chose French as the foreign language I would spend an extra semester studying than all the others. Maybe it was the countless hours I spent conjugating verbs, translating every word, and scouring through my diction book – letter by letter, rule by rule – before the days of ipasource.com. But for some reason, French mélodies have always been my favorite. For me as a performer, it was easy to sing out, sing boldly, sing loud, and be expressive. I could do that in so many of the languages and styles. What challenged me was this demand from French composers and style guides that insisted on nuance, elegance, and restraint in order to adhere to performance practice. What did that mean? How can I project my voice and yet restrain my voice at the same time? To me, French mélodies required a level of sophistication that played into my nerdiness in a way that the other styles did not. It was in this restrained emotional outpouring that I discovered new colors in my sound and was able to offer audiences a different type of gift than they were receiving throughout the rest of my recital program. This style was the smaller package that was wrapped neatly and thoughtfully. 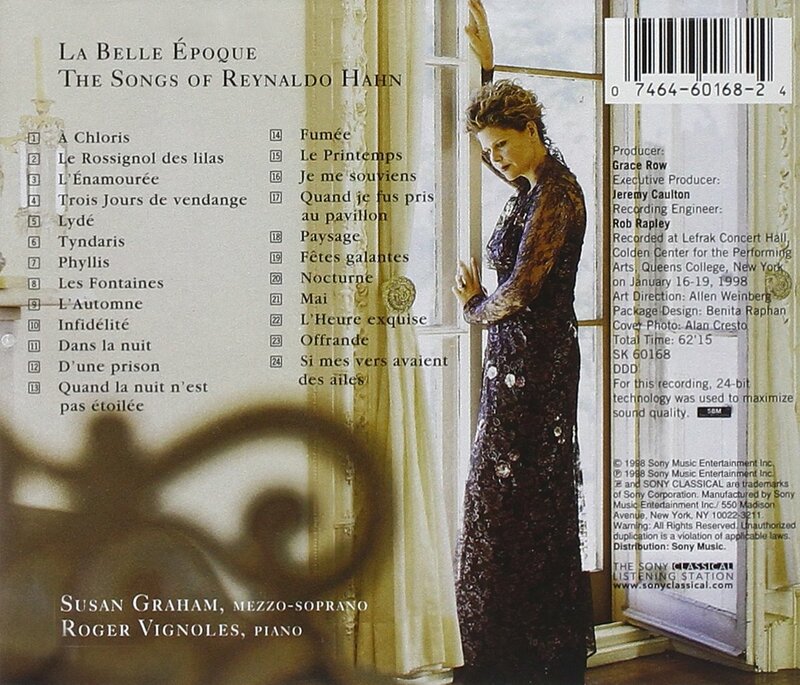 I still argue that the most beautiful recording I ever purchased was Susan Graham’s La Belle Époque – her recording of Reynaldo Hahn’s mélodies. Everything about the cover art, liner notes, her gown and hat, piano accompaniment, and sweeping melodies evoked France to me. I still have never been to France so I cannot profess to explain what that means, but to me, that album continues to create Parisian scenes in my head every time I listen to it. The simple elegance of “À Chloris,” the harmonic moment of failed love in “Infidélité,” the rage of the ocean in “Dans la nuit,” the heartbreak and loss of life recounted by tolling bells in “D’une prison,” and the voyeurism of looking in on party guests in “Fêtes galantes” was what I imagined wandering through the streets of Paris felt like. A swirl of emotions, colors, people, architecture, and carbohydrates. Now as I teach lyric diction and assign French mélodies to my undergraduate students, I am shocked by their reservations, fear of new sounds, lack of interest in being smarter rather than simply loud, and inability to see the same swirl of impressionistic romanticism that I fell in love with as a young student. A less stubborn teacher would certainly give in to cheapened portrayals, but I refuse. It is my job to teach, inspire, and perform in a way that shares emotions in an honest way with my students and audiences. We all serve the poetry in a way that honors the beauty, nuance, and style requirements of that period. Here are tips that have connected with my students and myself while learning to perform French mélodies with appropriate style. Save your crescendo for once you are in the confines of the vowel. Diction and style books discuss the lack of tonic stress in the French language. How will this sound differently to an audience? Does that mean French phrases are null of expression, musicality, and shape? Non! Rather than leaning into an initial consonant like we do in German, American, or British art songs, lean into the vowel following the initial consonant. Delay your crescendo by one letter. That way, our French melodic lines and longer durations can still be expressive, active, and moving, but we do not stress that particular consonant, and thus syllable, like we do in other languages. Suddenly you are eliding together a French legato line that is always moving towards the end of the sentence. High notes are equally important as final schwas. Caution young singers than higher pitches do not immediately get to be louder. If there is a lack of tonic stress or word stress in French mélodies, then our upward leaps must be de-emphasized and remain within the overall phrasal weight. That romantic crescendo into the higher pitch with unabashed emotions is better served in an Italian art song or aria. Instead, instruct the student to allow for spin and a crescendo on the upper pitch once he or she is safely past the onset. This still allows the visceral response for the audience of an exciting upper pitch, but this emotional delay and reservation creates a sophisticated approach to the interval. Rounded vowels are round. Non-rounded vowels may round. Praise be to Thomas Grubb for defining French consonants as “rapid, late, and clear.” For those of you have heard French mélodies performed with the mush-mouth dialect, you already know where we are headed next. Be careful of singing French or teaching your students that French is an overly rounded language. Where did we come up with that notion? My guess is that the roundness myth comes from the prevalence of final schwas in French. If the French schwa is defined as [oe] in terms of color and shape, then we would expect plenty of [ɛ] on the tongue and [ɔ] at the lips. That does not mean that every vowel should be modified past the point of clarity. Will certain voices adjust particular vowels in areas of their voice for acoustics? Of course. But be wary of the performance where the singer’s lips become a fixed funnel prior to phonation, only to release at the double bar. That performance will sound like melodic baby-talk. It is ok to be correct. It is ok to take your time. In an age of immediacy and quick fixes, encourage your students and yourself to spend time with the French language. There are new sounds to master – nasals, mixed vowels, glides, and defined schwas – and if they are to happen “rapidly, late, and clear,” it will take time to introduce your articulators and resonance spaces to these new demands. My recommendation is to close the piano lid, walk away from the piano so you are not even tempted, and return to the lyrics. Slowly move from syllable to syllable, removing consonants. Find how this syllable’s vowel moves into the next syllable’s vowel. Do that for the entire sentence. Suddenly, you have a vowel chain that you can practice repeatedly in the mirror assessing clear vowel shapes. Remember, your vowels are tone. Consonants are noise. Learning the vowel to vowel movement of the language provides pillars that your muscle memory must connect. Doing so can improve your legato line, the fluidness of the language, and allow your consonants not to destroy your constant motion towards the end of each phrase.